Currently SVS has a large data repository of annotation data sources from a wide variety of human, animal and plant genome assemblies. Additionally adding a custom genome to SVS has become quick and easy using our new Annotation Convert Source Wizard. 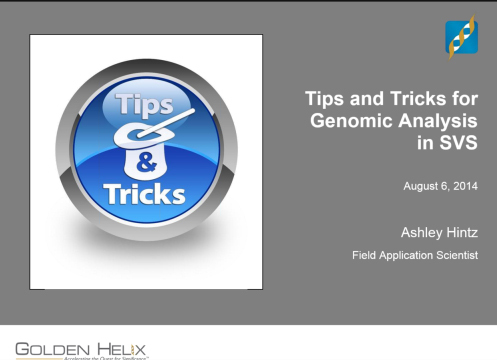 We will show you how to create an allele reference sequence track using a FASTA assembly file and gene annotation track using a GTF annotation file. Use the Build Sample Collated Spreadsheet function to create a per marker summary of your available sample information. For example if you have imported genotypes, read depths and genotype qualities for all your samples you can create a summary of those values for each sample at each marker location. SVS has a variety of ways to activate or inactivate data for further analysis. We have tools available that can activate your data based on a list of marker names or based on genomic position as well as tools that can inactivate duplicate values.